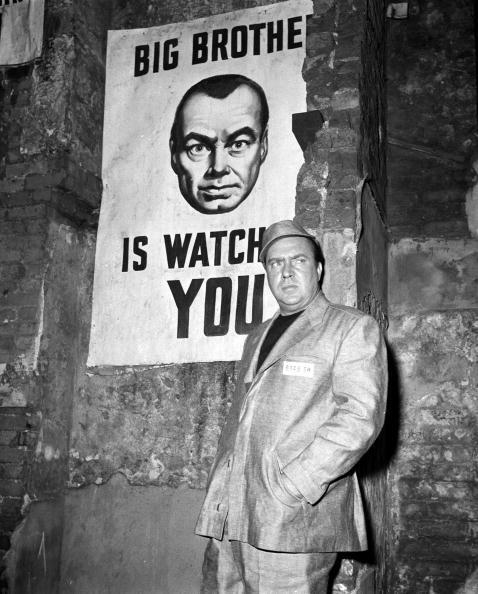 American actor Edmund O'Brien is pictured in a scene from the film "1984", based on the book by George Orwell (Stepney, London, England. 1955). Lake Effect's Bonnie North speaks with Jay Stanley. In a more innocent time, most of us in the United States assumed that unless we were breaking the law, our communications were private. The Fourth Amendment gives citizens protection against unreasonable searches and seizures and also gives the people the right to be secure in their persons, houses, papers, and effects. Most of us assumed that included emails, texts and telephone conversations. Turns out, not so much. Data collection has been making headlines in the past few years, as revelations that both government agencies and multinational corporations have legally gotten their hands on plenty of our communications. And depending on who’s doing the collecting, they justify it by saying they’re using it to stop terrorism or to better connect us to the stuff they think we’ll want to buy. Turns out Orwell was quite prescient in his classic novel 1984 - although it turns it out it might very well be private companies, rather than the government, that's getting us there. Stanley is a Senior Policy Analyst with the ACLU’s Speech, Privacy and Technology Project, and his area of specialty is in technology-related privacy and civil liberties issues. He says that big data has been a valuable tool for corporate marketing, even though it is frightening how accurate their data actually is. "We are increasingly sliced and diced by the large institutions that we deal with. We’re increasingly pigeon-holed into categories. We’re rated and ranked and sifted and sorted in ways that help them but don’t help us," he says. Stanley researches, writes and speaks about current and future technology-related privacy and civil liberties issues. He was in Milwaukee last week to meet with students in UWM’s Institute of World Affairs. More of our conversation with Jay Stanley.